Angel Tyus-Waldrop grew up in a Real Estate family. As a young child, she would accompany her mom in showing homes and play Mommy imitator with her friend. 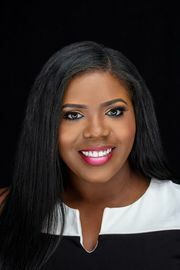 By 14 years of age, she was assisting her Mother on the weekends and sometimes after school and this was the start of her being developed in all aspects of the Real Estate profession. The Tyus family has been blessed to grow a full-service Real Estate Empire which includes: Flipping homes, Real Estate Sales, Property Management and Real Estate Education, in which Angel is a vital and valuable part. Angel is a licensed Realtor and property manager at Town Square Realty. She has her GRI (Graduate of Realtor Institute), ABR (Accredited Buyer Representative), as well as a degree in business management and administration. She is proud to use her education to manage the Real Estate office, serve as the school’s administrator and sometimes project manager when multiple projects are in place. She is married to her teenage sweetheart Damien Waldrop who also works in the family business, together they have two beautiful daughters, Alaysia Star (4 years old) and Aria Sky (2 year old). Angel is committed to God, Family and having fun making other people’s dreams come true. Together with her Mother and Sister, they are real examples of Live, Laugh and Love.